I enjoy learning from others and at the same time I enjoy sharing what I learn with others. Most of the time this transaction is asynchronous and simplex in nature. Last night I did some reading, receiving knowledge from another human being I have never met and unable to reciprocate in real time. This morning, I am choosing to transmit on a different topic to an audience that almost certainly doesn’t include the author of the book I read. There are times however where such an exchange of knowledge and ideas is reciprocal in nature, taking the form of an in-person conversation. I had a few of these deeper exchanges this week where all parties involved were genuinely interested in receiving advice, fully knowing that they also had something of value to give. When we receive advice from others, we take in what they share and filter it through our values, amplify or mute it based on our experiences, and translate it in ways that apply to our goals. Sometimes it takes hours or days after such an exchange to truly process the advice. Sometimes it is instantaneous because the giver has already done that for us before transmitting. That is to say that they understand and are able to share our feelings. They know us well enough to empathize. As I have written of late, in many ways I am a fish out of water right now. In so many other ways, I am firmly in my element. For those reasons, I have been seeking out people who have experienced or are experiencing similar feelings. Because they have or are navigating similar circumstances, they are able to filter, amplify/mute, and translate their advice before sharing. That is not to say that I am seeking out people I believe will tell me what I want to hear, but it is to say that I am choosing to benefit from people who know what I need to hear. I did have a recent exchange with a valued mentor who was offering me specific advice on things I should do as I take my responsibilities to the next level. It was a rather detailed plan of action. I stopped him and shared why I was making other activities my priority at the moment. To which he promptly corrected himself, admitting that he was projecting what he would do and has already done, while also acknowledging that our starting points on our respective transitions to our current roles are very different. His re-vectored empathetic advice was spot on. I find myself doing my best to empathize with my son. I vaguely remember being 14, but I was never a teenager in this hyper-connected, exponentially evolving world we live in today. Despite my best effort, I am certain that he has to do a fair share of post-conversation processing to apply it to his day. That is not to say that I don’t have much to offer him, but to freely admit that there is a fair amount of unintended self-projection that accompanies my advice. Self-projection that ought to be filtered/translated to some degree. The last thing I want him to do is follow my advice merely because he doesn’t want to disappoint me. I don’t want him to live a life shaped by guessing as to what he thinks I want him to do. I want him to live the life he chooses based on informed decisions, fully knowing he has the love and support of his family. It can be seen all too often, people doing things merely because others who project their own values, experiences, and goals advise them to. I would venture to guess that many children are blindly following a path that their parents laid out for them. Many of them will go into great debt to get a college degree that they don’t really want and will likely never use. And still many of them will trap themselves into a job and mortgage living a life that won’t fulfill them. We as human beings are influenced by the world around us far more than we care to admit. Our lives are a result of the people we make a part of it. Our lives are a result of the decisions we make along the way. And those decisions ought to be ours, with the added benefit of the advice of empathetic advisors. I am not reluctant to give advice and when I do, I do my best to know the audience. The advice I give the mirror is different from the advice I give my son or the advice I give another protege. Mentorship is not about self-projection, but about tailored guidance. If we don’t know the audience well enough to provide tailored guidance, we ought to make that clear. When we can’t give empathic advice, we ought to ask the questions they should be asking themselves. And we ought to remind them that, ultimately, they must decide what is right for them. That’s a lot of pressure for some, especially those who have grown accustomed to being told exactly what to do. But it’s pressure that allows them the opportunity to truly own the outcome. And it’s such ownership that allows each of us to acknowledge that this adventure is, in fact, our own. 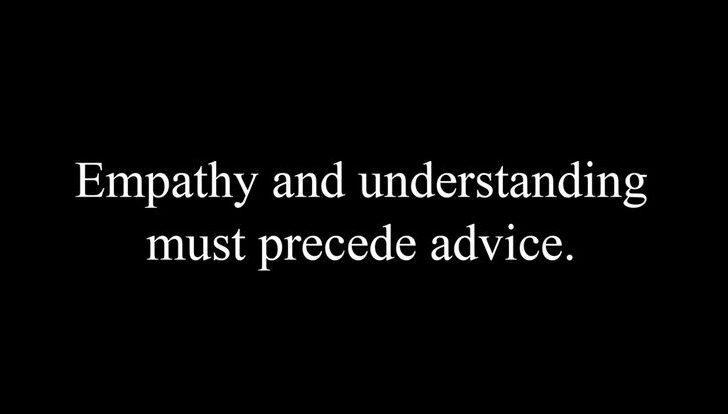 Do you seek out empathetic advisors? Are you projecting too much of yourself when you advise others? Whose life are we actually living? Whose life are we encouraging others to live? I went through what I consider 4 career goal changes, from wanting to be an electircal engineer, to Navy Cryptology, to broadcasting & some journalism, to Computer Accounting systems. In each change, I had to go through schooling, and periods of learning. Each change was difficult and the first 3 required me to move to a different part of the country. Fortunately, my family (wife & 3 boys) came through it OK, but eventually staying in one place at the end (up to my retirement) helped. Louis Kornfeld, the 1970’s Radio Shack President who authorized the first TRS-80 production, always said that a chief executive (or top leader) also should be a top salesman first, because as a business leader you not only have to sell your company and what it provides, but you also have to “sell” your partners and employees that your choices are the “right” ones. The best salespersons are the ones who become the unpaid member of the client’s staff, because they are the salespeople who takes responsibility for what they are selling, and if it isn’t the right thing, they help make it right. I learned that early in my Broadcast career, but it took me a long time to actually get there. Jumping to a new business area means you have to learn the new jargon, and product, but the ability to make tough decisions and lead others to follow those decisions comes down to your ability to sell the future course to the rest of the organization.